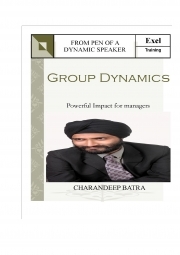 Description of "Group Dynamics (eBook)"
Group dynamics is a study of groups which exists in this world; it’s about performance of groups which led to high level of success and failures. It’s about how to work effectively in a group, it’s about how to behave in a group, it’s about how to lead a group, and it’s about how to achieve success in a group. It deals with psychological, social, behavioural. Political and Monetary achievements of groups. Batra group was formed way back in year 1996 with the name of Batra Consultancy. The founder of the organization is Mr. H.S BATRA who started his carrier as development officer in oriental insurance in 1982. Aim of the company is to satisfy the insurance need of individuals and entrepreneurs. Reviews of "Group Dynamics (eBook)"